The dinosaurs look at you, as if you're in their space, creating a unique experience that’s technically very easy for people to set up. Digital Decorating company, AtmosFX, today announces Dinosaur Encounter, the first-ever prehistoric Digital Decoration, perfect for dinosaur-themed birthday parties, special celebrations, and any space in need of life-like dinosaurs. 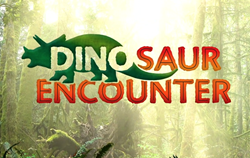 Dinosaur Encounter features four realistic looking animated dinosaurs: a Triceratops, a mama Brontosaurus with her baby, a pack of Velociraptors, and the ferocious Tyrannosaurus Rex. These dinosaurs can appear in windows, thunder across walls, or even roar out of birthday cakes with the help of AtmosFX’s Digital Decorating Kit, or a home theater projector. The collection features four types of dinosaurs; Tyrannosaurus, Triceratops, Brontosaurus, and Velociraptors, who thunder into your home sniffing, roaring, frolicking, and fighting with all the ferocity that earned them the title, "terrible lizards!" The Tyrannosaurus rex, the monarch of dinosaurs, hunts for her next meal. She's on the scent of her prey, so watch out. The Triceratops may seem dull-witted and slow, but those horns and powerful charge prove a challenge to a would-be predator. The Velociraptor is a pack hunter, so don't be fooled when you only see one — because that's when the attack comes. When a baby Brontosaurus can't quite reach the tasty leaves of the jungle canopy, his titanic mother is there to help. AtmosFX is the fastest growing Digital Decorating company in the world, creating memorable characters and realistic environments for at-home displays. With customers in 120+ countries, AtmosFX brings parties, Halloween haunts, and homes to life with decorations and Digital Decorating Kits that transform any home or space into an immersive experience. From a crafty, yet clumsy witch, to Santa, zombies, the Easter Bunny, a winter wonderland, and much more, AtmosFX offers dozens of beautifully animated, amusement-park-quality scenes and characters that can be viewed on any tv or monitor, and projected on flat surfaces – even windows. Founded in 2006, MTV alumni Pete Reichert and Pete Williams today, lead a team of 30+ artists, creating amazing, year-round Digital Decorations. As industry leaders, AtmosFX provides a virtually instant way to decorate anywhere, any time of year.